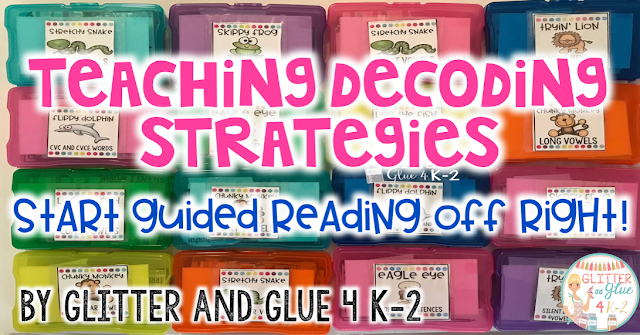 Glitter and Glue 4 K-2: Using Decoding Strategies: Start Guided Reading Off Right! Using Decoding Strategies: Start Guided Reading Off Right! What an important time of the day guided reading is! It can be a difficult time to plan for, but it is so important to get our new readers reading out loud and reading with a purpose. Before you start your guided reading time, it also important to have an instructional focus selected. 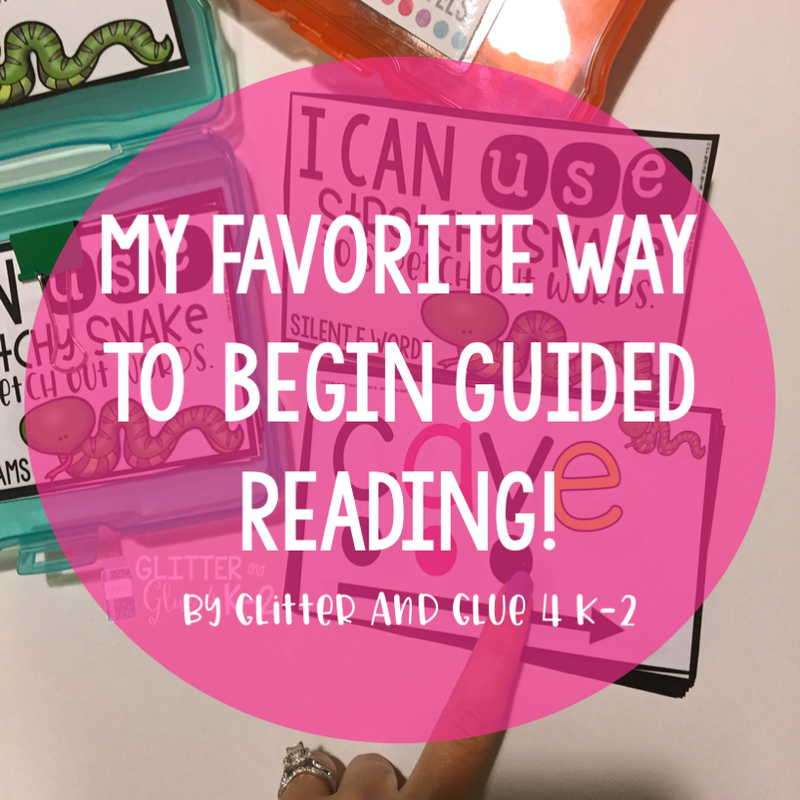 During guided reading your focuses may include: a comprehension skill, vocabulary words, and word work. 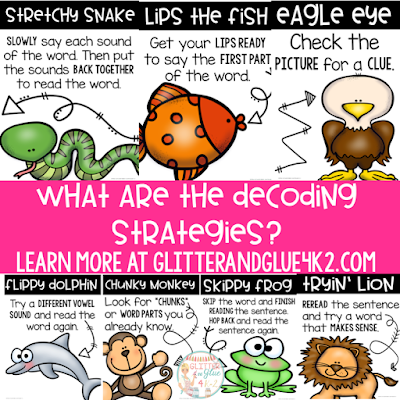 One thing I am guilty of neglecting to teach is decoding strategies. 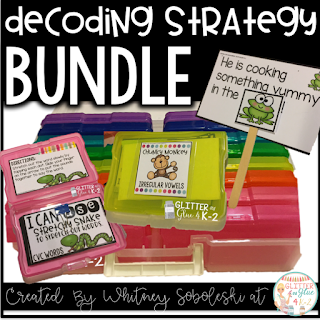 Decoding strategies are important tools that allow students to take some kind of action when they come to an unfamiliar word. Sometimes students come to an unfamiliar word and are just "stuck." Most often, it's our struggling readers that don't use strategies. 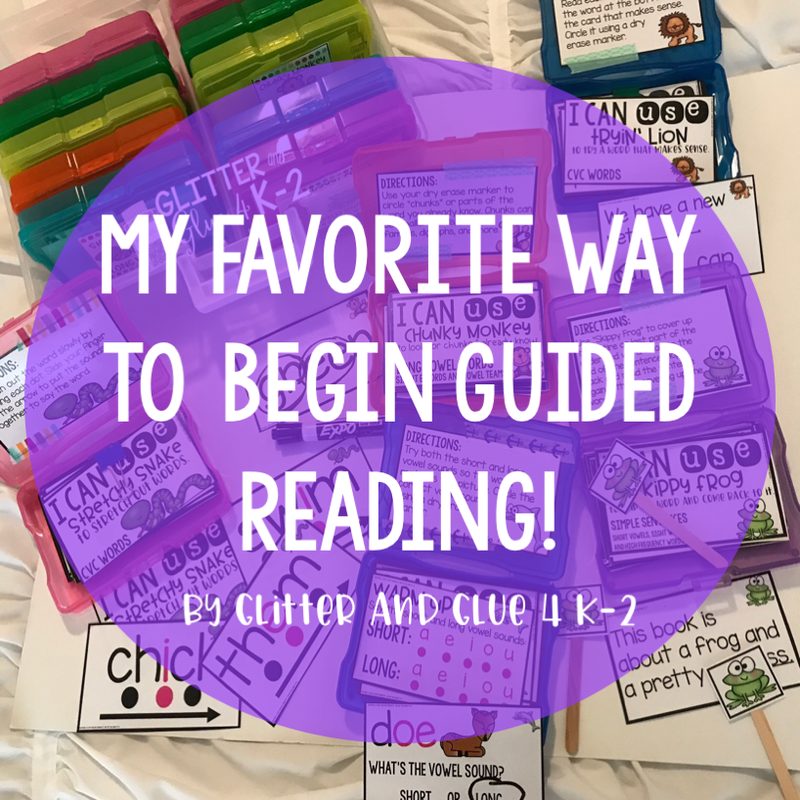 In order to help students grow as readers, we need to teach them strategies! My favorite way to start off guided reading, is by choosing a strategy to focus on. The strategy that you choose, may depend on the text you are reading. If the story you are reading has high frequency sight words, a predictable pattern, and lots of picture clues, you may want to focus on the eagle eye strategy. If your story has a lot of words with vowel teams, digraphs, or another phonetic concept, you may want to focus on chunky monkey. As the teacher, you're the expert on what your students need! :) All of the strategies are helpful so you really can't go wrong! We typically spend about 5-8 minutes working on the strategies before we begin reading. The time you spend working on them may depend on your group's grade level and how long they can focus. Before you start using your strategies, you need to get the cards organized! I store my cards in the Recollections Color Photo & Craft Keeper ! Click the photo to grab the storage container! If you don't want to purchase it, you can always hole punch them and store them on ring if you don't want to purchase the craft box! Before my students start reading, I show them the strategy we are focusing on as an "I can" statement" I explain to them what they will do and how to use the strategy. I attached this to the bottom of the lid of my craft box. Once I have chosen my strategy, I pass out the task cards to students. There are several different levels to each so be sure to choose the phonetic concept your students need practice on. Choose the level that is right for your students! You may wondering how each strategy works. Check out each strategy below or check out the video to see them in action! Have the student tap each dot and say the letter/letters sound. They can drag their finger across the arrow to blend the word. Have the student say the first sound of the word. Then, they can slide their finger to say the rest of the word. They can read the word altogether at the bottom. I’ve included a quick “warm up” where students will quickly tap the dots and read the short and long vowel sounds. Have the student read the word using both the short and long vowel sound. They can decide which vowel sound makes sense and matches the picture. They will then use a dry erase marker to circle the answer, long or short. It will be pretty easy for students to read the word since it matches the picture but it really gets them thinking about short and long vowel sounds! Cut out the frogs (included) and glue them on popsicle sticks. Have students cover up the end or entire underlined word when reading the sentence. After they have read the sentence, they will uncover the word and reread the entire sentence to decode the underlined word. Students may be able to solve the word using the context of the sentence or, if needed, they can use previously learned strategies. First, students will read the sentence. Then, they will read both word choices and decide which word makes sense. They will circle the word with a dry erase marker. Students will read the sentence and use the picture clue to read the underlined word or words. I hope this was helpful! If you'd like to get these cards you can purchase them at my shop by clicking here! What strategies do you use in your classroom? Leave me a comment below! Want to come back to this blog post? Pin the image below! Being a mother and teacher myself I am always looking for some good and innovative techniques which I could use for teaching. And your blog is of that kind. Amazing ideas. Where can I buy the plastic storage system for your cards? looking into purchasing... how big are your guided reading groups? do you do the cards with your group all together or does each child get individual cards? When you give students their own cards, are they working on the same strategy? For instance, are they all working on cards from the same little box? If so, do you feel that there are enough cards for the group to practice multiple times? How can I get the cards please? Do you need all 16 boxes in the photo/craft keeper for these cards? These look amazing! Are there different levels of difficulty for each strategy? If so, how many levels are there? 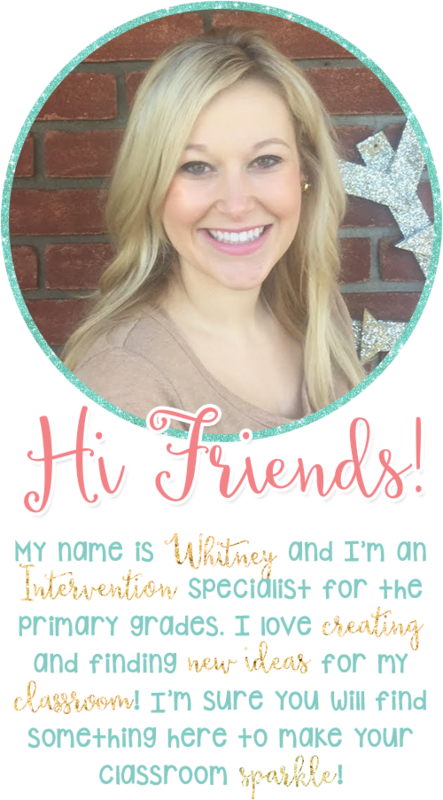 Do you have anything like this for Phonological/Phonemic Awareness Skills? Hi! There are two-three levels depending on the strategy. I don't have it for phonemic awareness but that is a great idea!